The restaurant industry has had a difficult time for the past couple of years as it has faced increased competition and concerns about oversaturation. Adding insult to injury, many restaurant chains have suffered from the hurricanes that hit the Gulf Coast and the Caribbean during the third quarter. Amid those difficult conditions, Texas Roadhouse (NASDAQ: TXRH) has stood out as a stalwart player in the industry, and that has inspired many shareholders to think that the steakhouse chain can succeed where its peers fail. Coming into Monday's third-quarter financial report, Texas Roadhouse investors were hoping that the company would be able to deliver reasonably strong growth despite the headwinds it faced. Texas Roadhouse's results were consistent with those hopes, and the restaurant chain gave an outlook for 2018 that pointed toward continued momentum for the future. Let's look more closely at how Texas Roadhouse did and what's ahead for the steakhouse specialist. Texas Roadhouse's third-quarter results sustained the solid 2017 that the steakhouse chain has had so far. Total revenue was up 12% to $540.5 million, edging slightly above what most of those following the stock had expected to see from Texas Roadhouse. Net income was higher by more than 20% to $31 million, and that worked out to earnings of $0.43 per share, matching the consensus forecast among investors. What was most impressive about Texas Roadhouse was the fact that comparable-restaurant sales continued to rise from past quarters. Among company-owned restaurants, comps were up 4.5%, and franchised locations did even better by posting 4.7% growth in comparable-restaurant sales. Those figures both outpaced what Texas Roadhouse achieved in the second quarter, which in turn had been better than its first-quarter gains. Texas Roadhouse continued to see mixed performance in its cost containment. Lower food costs helped make things easier for the restaurant chain, but wage rate inflation ended up outweighing that downward influence. The result was a drop of almost a third of a percentage point in restaurant margin to 17.8%, but Texas Roadhouse kept general and administrative costs under control, and a lower effective income tax rate helped preserve more of the company's profit growth. The pace of new Texas Roadhouse restaurant locations also stayed stable. Seven new company-owned restaurants opened during the quarter, including two Bubba's 33 locations. A franchise location also opened its doors, bringing the total number of locations to more than 540 restaurants across the company's international system. CEO Kent Taylor was happy with how the company did. "We are pleased to deliver another solid quarter of results," Taylor said, and the CEO once again pointed to increased numbers of customers in driving comps growth during the quarter. Can Texas Roadhouse keep sizzling? Texas Roadhouse thinks that it will end 2017 well. Taylor said that positive sales momentum has continued into the fourth quarter, and the company intends to keep growing in 2018, with 30 new restaurant openings and a capital allocation strategy that will focus increasingly on dividends and other ways to return capital to shareholders. The restaurant chain once again made some minor changes to its 2017 guidance. The company now believes that it will open 26 or 27 restaurants this year, down from 27 to 29 three months ago. Food price deflation will be better than expected, with declines of 2% at the lower end of its previous range. However, labor inflation of 7% to 8% will be slightly higher than previously anticipated. For 2018, Texas Roadhouse expects more of the same. Comparable-restaurant sales should be positive, and the 30 restaurants that it intends to open should include up to seven Bubba's 33 restaurants. Flat food costs and mid-single digit percentage increases in labor inflation should be roughly comparable with where the restaurant chain finished this year. 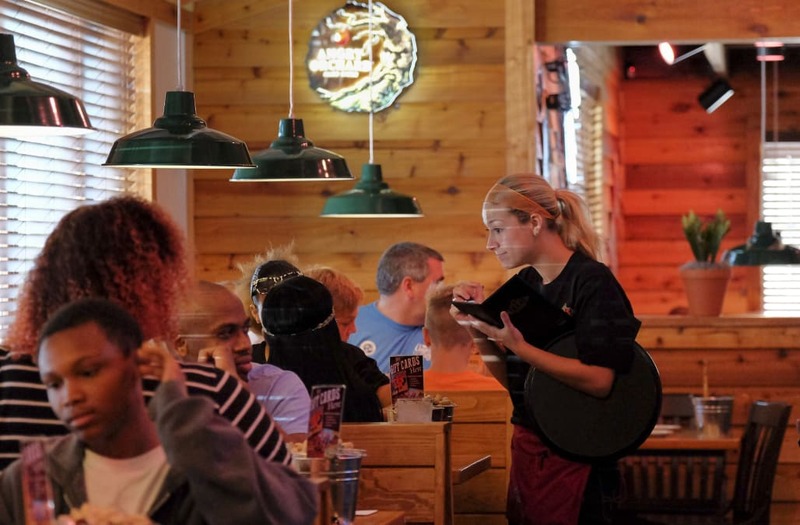 Texas Roadhouse investors weren't entirely satisfied with the restaurant chain's showing, and the stock eased downward by about 1% in after-hours trading following the announcement. Nevertheless, for those disappointed that the company didn't provide even better performance, it's important to keep in mind that things could have been far worse given the particularly nasty few months that the industry has seen.